Chewy, slightly soft, very buttery, nicely salty. What more do you want? This recipe scales up pretty well, I had started out with a larger recipe but decided the 170 mL carton of cream is the most common carton. If you want to scale it down, you’d need to find specialist pots though. Choose a pot that will leave plenty of room for the ingredients to bubble up, I used to use the middle size (18 cm) pot in my saucepan set, but lately I picked up a taller 15cm pot. The pot also needs to be narrow enough that the liquid height reaches the thermometer comfortably. If you’re using a glass candy thermometer in a metal housing, they usually sit right at the bottom of the pan, as the metal is designed to keep the bulb off the bottom of the pan. With a probe thermometer, you’ll need to adjust the clip (before you put anything into the pot) such that it’s at least 5mm off the bottom of the pot, otherwise you’ll a) get the wrong temperature, b) damage the probe and break your thermometer. Now that you have the right pot and the thermometer is adjusted, weigh all the ingredients, apart from the vanilla, into the pot. Put the pot on a medium heat and stir until all the sugar is disolved. Clip the thermometer to the pot and allow it to come to 125 °C. In the meantime, line a dish with baking paper (I use a 15 cm x 15 cm square dish). Yes, this 15cm x 25cm dish isn’t the dish I call for in the method, but it’s a good dish for a scaled up quantity or a regular quantity with 100g of salted peanuts. As soon as it reaches 125 °C, take the pot off the heat and stir in the vanilla. Pour into the prepared dish. Any bubbles can be moved with a spoon, or you can just ignore them. 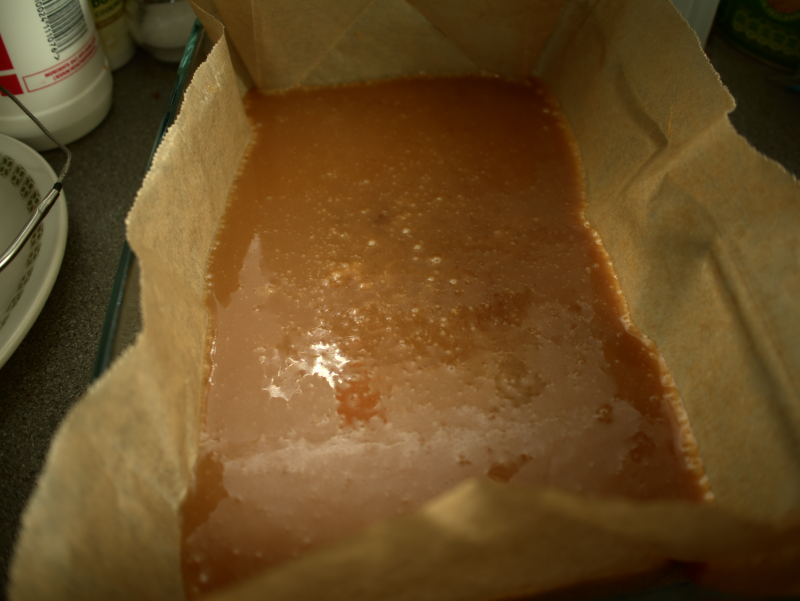 Let the caramel set overnight at room temperature. 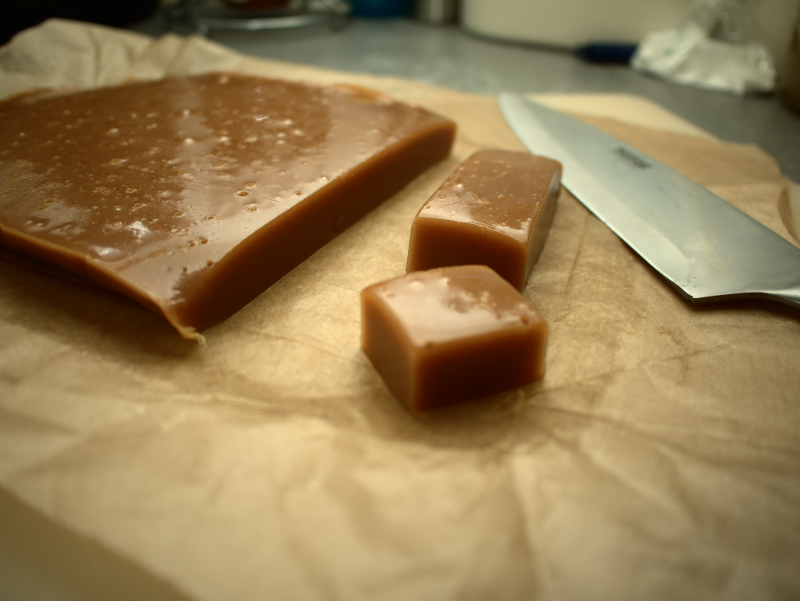 When set, the caramel can be sliced with a big knife. I usually slice off a row then make it into small pieces before cutting the next row, as when you go boldy into cutting the whole thing as a grid it tends to stick to itself. Either keep the caramels in an airtight container, separated with waxed papers, wrap them, or dip them in chocolate to … ehh… protect them from the environment. 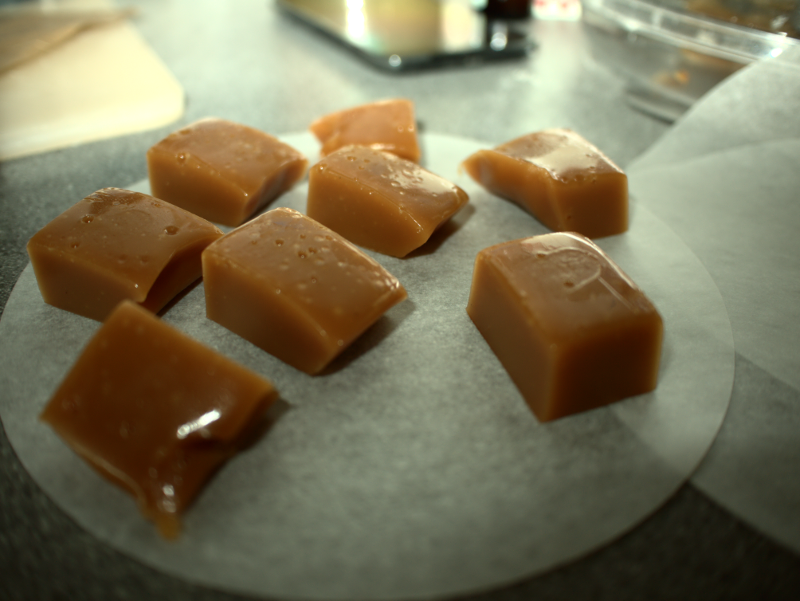 Salted caramels, carefully placed on non-stick paper. To make Ladies Mini Marathons, pour the caramel over 100g of salted roasted peanuts (in a slightly larger dish), then when it’s set, cut it up and dip it in plain chocolate. After the cooled chocolate sits for a few seconds, touch the top with a fork to make tiny little pyramids on top. 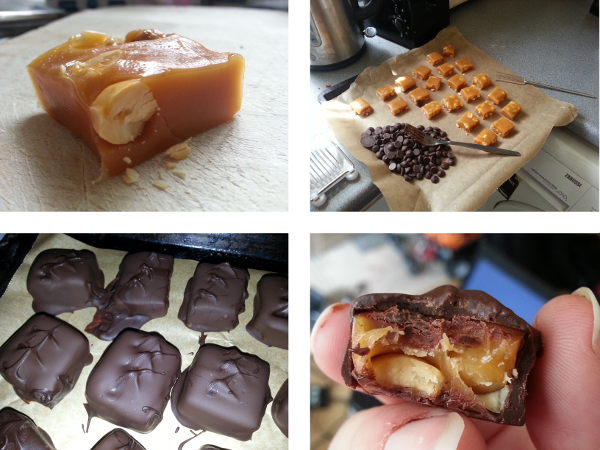 Even if the chocolate’s not well tempered, or the caramels aren’t fully coated, they still taste great and anyone who likes peanuts in caramel and chocolate will be demanding you make more of them, for practise of course. Leftover tomato sauce from pizza has to get turned into something tasty. It’s even better if it can be turned into something delicious with low effort for the next day’s dinner. Pasta bakes can be prepped ahead of time and thrown in the oven whenever, making life pretty easy. Soaking the pasta in hot water instead of going to the trouble of boiling a pot of water makes things easier again. Cover it in cheese, and sure put more cheese on it when it’s served up. As the pasta will be baked in the oven (and possibly sitting in sauce for 24 hours), it doesn’t need to be fully cooked before assembling the dish. By soaking the pasta in water before cooking, it has time to fully hydrate, the final stage of cooking can then happen in the oven. Using hot water shortens the hydration time, but cold water works just as well, but takes longer (I use this method for lasagne as I like to do a long low simmer on the ragú). The starches all swell up with the water, and don’t take anywhere as long to cook as usual. Don’t forget to salt the water as usual, and to save dishes, I soak the pasta in the dish it’ll be baked in. Respect to Ideas in Food for the idea, and their book of the same name that’s light enough to read in bed. I’ve been soaking lasange sheets since I read it. The other advantage is that your pasta probably won’t soak up as much sauce as usual, so you’ll still have an actual sauce in your pasta bake. The choice of sausage doesn’t matter. Pork sausages are tasty, but vegetarian sausages are easier in this house. Pick whatever you like, and leftover onions from dressing pizza are welcome too. I like to assemble this while the pizza is cooking, so two day’s worth of dinner are out of the way in no time. 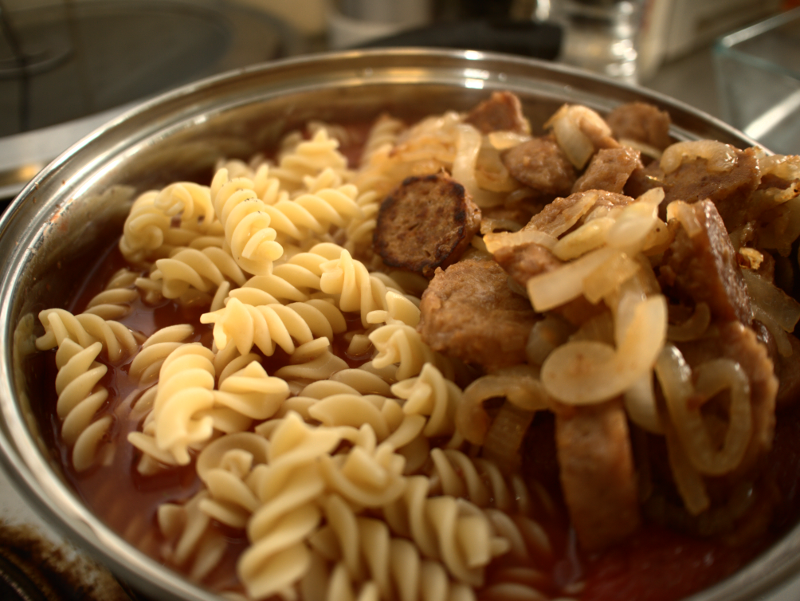 Pre-soaked pasta, sausages, onions, tomato sauce, ready for mixing before baking. Slow cookers are great for ignoring; put things in, turn on, ignore, eat. You can ignore them completely if you get one with a timer, or get a timer plug. The things made in slow cookers aren’t delicate, but they can end up juicy and tender. They usually travel well to potlucks, where you can wow people by telling them “oh yes, this took 8 hours to make” (although it took only 10mins of hands on work). Shredded chicken takes 8 hours on low. During this time, all the connective tissue between the muscle fibres breaks down and melts away. You’re left with juicy shreds of muscle for very little work. The seasoning can be changed to suit. To minimise the work in this, I pick up a packet of taco seasoning. The full packet can be a little salty in the small volume, but you can add less or make your own. The shredded chicken is great with bowls of rice and some grated cheese, but you can also just serve it up as a tasty dip for crunchy tortilla chips. If making a mess is your thing, then load it into burritos. It freezes well, and seems to keep its flavour for a long time. I’ve eaten this from the forgotten depths of the back of the freezer months later, and it’s been grand (though you’re best off eating it w/i a month before freezer burn or general degradation kicks in). Brown goop. *Delicious* brown goop. The other week, I was asked to give a five minute overview of my experience as a postgrad and any advice I thought might be useful to incoming postgrad researchers. I discovered that five minutes is not enough, and that other’s don’t seem to think I’m as cynical as I am (or it just didn’t come across clearly). About five years ago I started making yeast breads and asked my beloved for a pizza stone for my birthday. Thus began the great pizza-making adventure. A good yeast bread isn’t too hard to make, though making great yeast bread took a bit more experimenting. Same with the pizza, a good pizza is easy to make, great pizza takes a bit more thinking, but even failed attempts are delicious. For yeast breads, I found that I am very happy working with stupidly wet doughs. Though it took a couple of years to get there, it’s worth every ten-minutes-scraping-your-hands-under-the-tap-trying-to-get-the-sticky-dough-off until you realise that you don’t even need to knead this bread all that much. You end up adding a bit more flour when you roll out the pizza bases but the matching loaf made with the leftover dough is wonderfully fluffy with a chewy crust. Last year I picked up a tub of horlicks intending to make @wholesomeIE‘s malted milk biscuits (which I still haven’t made…) and wondered if there were any other recipes I could use it in. 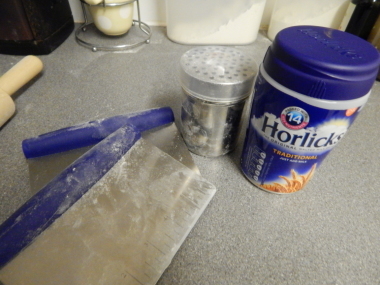 Horlicks is a mix of malt and milk powder, so I wondered if you could use it as a dough improver. A lot of the loaves of yeast bread I made, I used half milk/half water as it gave a softer inside and the bread lasted a two to three days without turning into a rock. It turns out horlicks is a brilliant dough improver. 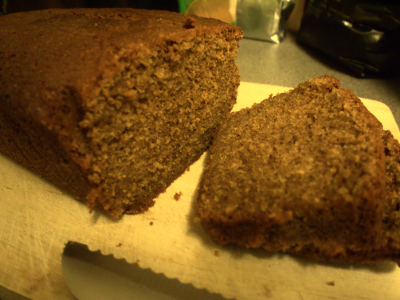 The horlicks bread keeps as well as the milk breads and gets a browner crust thanks to the malt. The pizza crust turns out better than a milk bread pizza crust too. Since I discovered horlicks as a dough improver, I haven’t made a batch without it and have gone through two tubs of horlicks (it’s also nice added to hot chocolate, but made up on its own with milk it’s gross). As well as owning a pizza stone, I can highly recommend owning dough scrapers. They’re pretty handy for scraping wet dough off surfaces, folding over wet dough, and scraping all the flour up when you’re finished. You can use them to cut dough as well, or move lumps of dough about. After five years of making bread without them, and a few months making bread with them, I would say don’t wait as long as I did to get a pair (one is good, two are better). Instead of trifle and romantica, for Christmas dessert this year my mother requested I made my lemon drizzle cake and she’d make a Bailey’s cheesecake. 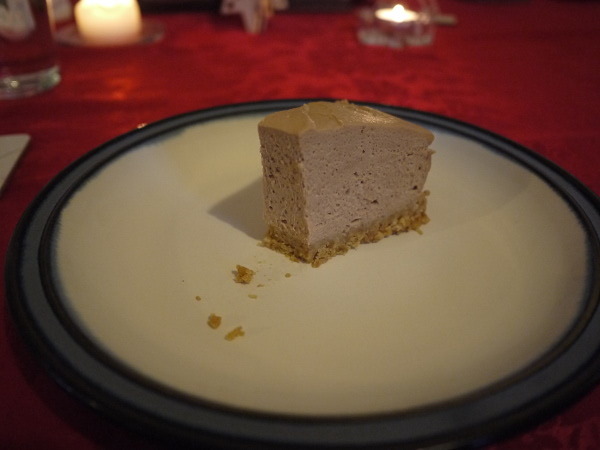 When the drizzle cake was made, I offered to make the cheesecake while I was at it, as I love making cheesecake and don’t make it as much since I moved to Dublin (my beloved doesn’t care for it, and the fridge in work is just manky so you can’t offload it there). 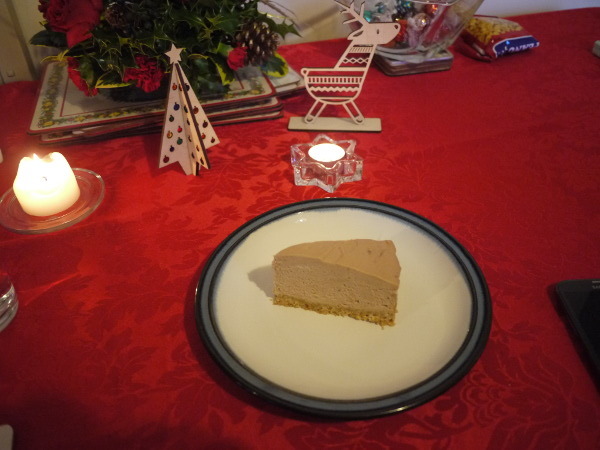 I probably based the recipe off a few other cheesecakes I made years back. Before I left for Dublin, I left the recipe with my mother who gets to make it a lot more often than I do, so I just used that piece of paper instead of my memory. It’s gelatine free, the chocolate ganache isn’t runny so it stays reasonably stiff. If you like, you can leave out the Baileys. Use the best chocolate you can find, there’s so few ingredients that you want to use the finest you can. The biscuits are counted out as filling the 18cm loose bottomed tin at a depth of approximately 2 biscuits, I’m not sure how much they weigh, someday I’ll check. Crush them in a strong plastic bag, ziplock top bags are usually sturdy enough or double bag a thin sandwich bag. You can bash the biscuits with a rolling pin or you can just mash them with your fingers. Chocolate digestives work well with it too, they’re smaller, so you’ll need more than eleven 🙂 For a larger tin, scale up the biscuits and butter, scaling the cheesecake depends on whether you like a huge layer of cheesecake on the base or not. Floral arrangement by my mother, laser cut decorations by Fiona Snow, cheesecake by me. Melt the chocolate with 50 mL of the cream. Stir well and set the ganache aside to cool. Crush the biscuits well. Stir into the melted butter and press into the bottom a loose bottom or springform tin (my mother’s tin is about 18cm in diameter, you can use slightly larger too). Pop into the fridge until you’re ready for it. When the chocolate ganache is cool, beat it into the cream cheese, then beat in the baileys. Whip the remaining cream. Fold the cream into the chocolate mix, then pour on to the biscuit base. Put in the fridge for at least 2 hours if not over night. To get the cake out of a loose bottom tin, put it on top of a can (beans, chopped tomatoes, it doesnt matter), and press down evenly on the sides. There’ll be minimal cheesecake left stuck to the sides. For springform, loosen the spring slightly, if you need to free the cake a little, run a knife around the edge. Then open the spring fully and lift it off carefully. Then enjoy any cheesecake that was stuck to the sides! I love cinnamonny things, especially on a winter evening, but you can’t have mulled cider everytime you want a warm spicy treat. This spiced madeira cake is a lovely, caramelly treat that’s great fresh from the oven, or taken from the freezer and toasted. The muscavado sugar gives a lovely molasses-y flavour, and I added the nutmeg, cinnamon and ginger in my usual quantities of 1:2:3. If you had ground cloves, they might go well in the cake too. 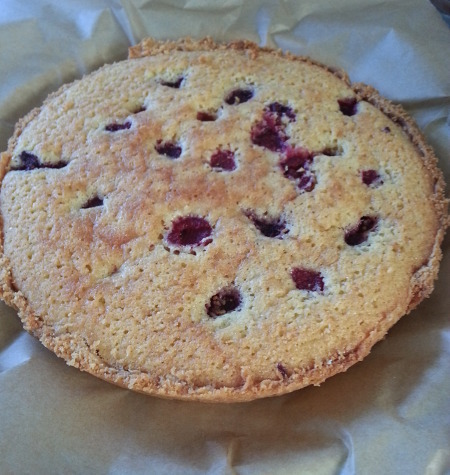 I only keep cloves for mulling though, so my cake gets a pass on that flavour. I don’t care for fruit cake, but you could add any sort of dried fruits that you think might go. Madeira cake is pretty forgiving, so you can add as much as you feel like (or none 🙂 ). Look at that lovely cake. All the flavours of Chrismas, with no hidden fruit. 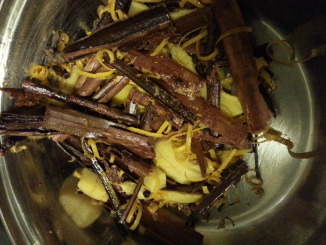 Mulled cider is a great drink on a winter evening. Heavy on the cinnamon, warm to clutch in your frozen hands. What’s not to like? (Cider itself according to himself). So I make mulled cider for one by adding some pre-spiced syrup to a single can or bottle of cider. It’s a fairly flexible recipe, so if you want it sweeter to go with a dry cider, add more sugar. Love cloves more than I do? Fire a few more in the pot. Can’t find ginger root? Substitute it for crystalised ginger and remove some sugar (I think I dropped it by 50g that time). I add the juice toward the end, as I don’t think it benefits from boiling. You can just quarter the oranges and throw them in at the start, but it doesnt really get as much juice out and you end up with some bitterness. If you’re hosting a party, skip making the syrup and add everything bar the water to the cider and heat that for a half hour instead. 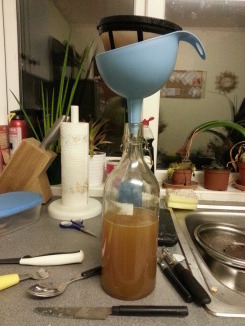 I usually end up with about 600mL liquid in the end (after reducing to half and then adding in the juice), which does about 2.5 – 3L cider. As when mulling wine, if you use a terrible cider, it will be drinkable, but if you use a good cider it’ll be outstanding. If you’re planning to use it to mull apple juice (or low alcohol ciders), reduce the sugar by at least half, they’re very sweet to begin with, and adding loads of syrup will make it undrinkable. Put everything except the juice in a pot. Heat until it’s steaming gently but not boiling. Stir occasionally till the sugar is disolved. 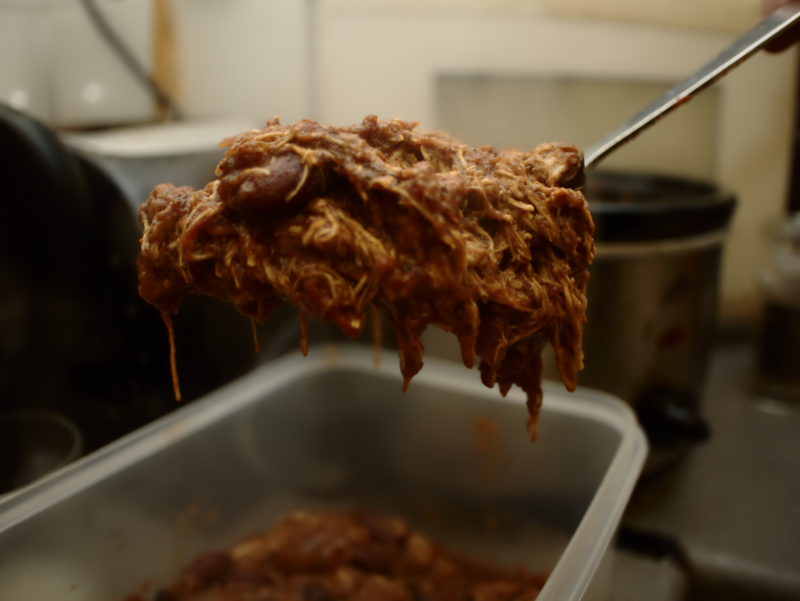 Continue to heat for about an hour and the liquid has reduced to half or a third of the starting volume. Add the juice of the oranges. Strain into a bottle. Let to cool, then store in the fridge. The sad remains after the syrup is done. When you want a hot cider, pour a bottle or can into a pot, add about 100mL of the syrup (or more or less to taste, 500mL + 100mL is about right spicewise to start with, drop to 60mL for longnecks). Heat gently and pour into a giant mug (or two regular mugs if you can share). I usually swirl the bottle of syrup before pouring as the ground nutmeg settles otherwise (it fits through the strainer, so it’ll always be there). Thanks to Lidl and Clare, I now own a waffle iron. 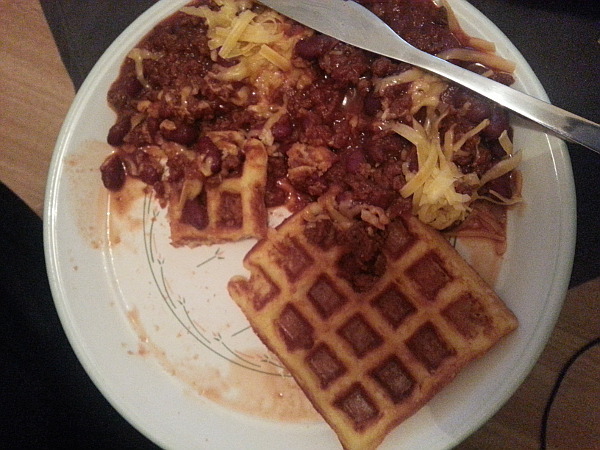 I’m still trying to figure out the optimum breakfast waffle, and have yet to try mad things like waffling brownies, but I did make a potato-corn-based-waffle for going with delicious chilli. It’s not like a Potato Waffle, but as they’re already perfect and available frozen by the kg, I don’t need to figure those out. 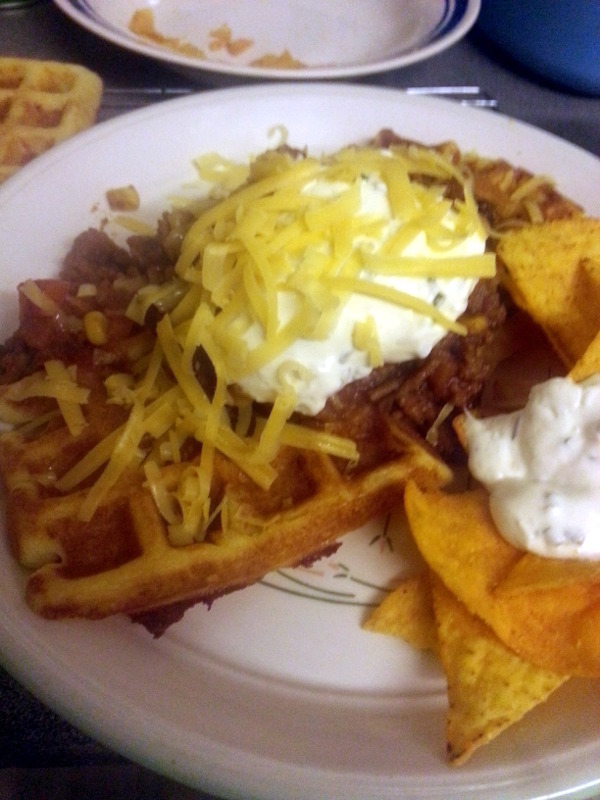 Waffles with beef chilli, sour cream and chive, tortillas and a reasonable amount of cheddar. There was no time for finding the proper camera, so it’s back to phone pictures. This recipe makes about 6 Belgian waffles-worth. Enough for three big plates of chilli, or two chillis and some breakfast. Mash up the potato with the flour, polenta, and baking powder. Beat the egg and milk together in a jug. Pour into the spud/flour mix, beating all the time with a fork. The mix doesnt need to be smooth, just well combined. Turn on the waffle iron, and brush the plates with butter. The batter puffs up, thanks to all the baking powder, so take care not to overload the iron. Turn halfway through cooking if needed. Serve with chilli and lashings of cheese and sour cream. Any leftover waffles can be cooled on a wire rack and toasted for breakfast (or frozen for the next time you have chilli). In my quest to learn how to make laminated doughs (think croissants), I picked up Murielle Valette’s Patisserie. It’s brilliant, I’ve even cooked more than one thing from it already (croissants, pain au chocolate, lemon tart, dense chocolate cake and the modified bakewell below). For my colleague’s birthday, I insisted on making her some cake, and made a bakewell as I had all the ingredients to hand (in fact, the pastry had been made and frozen the weekend before). 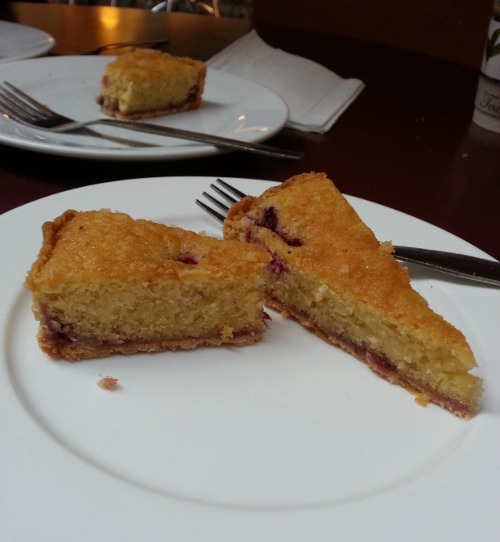 Instead of the apricot and almond tart in the book, I went for a raspberry bakewell, which went down very well when I brought it into work on the Monday. 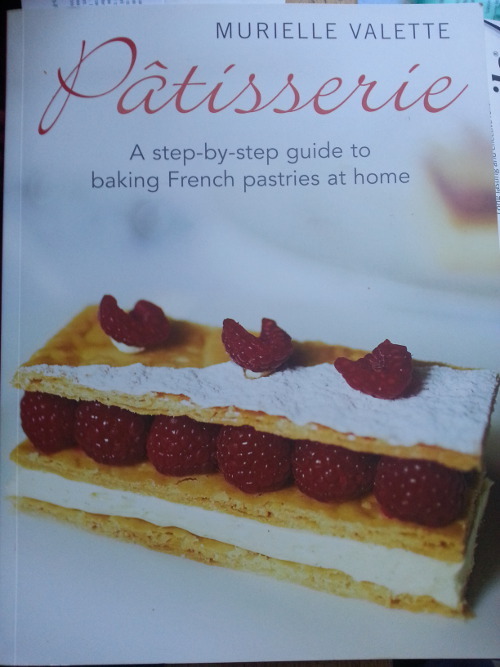 I’d highly recommend the book if you like French pastries (and cake in general), it’s divided into a techniques section and various chapters based on particular doughs (puff pastry/brioche/choux) and I’ll certainly be making more from it. It’s a great way to fill your workmates with butter, as it’s a critical part of most of these tasty treats. Rub the flour and butter together until it’s breadcrumblike. Don’t overwork it or the butter will melt and the pastry won’t be lovely and crisp. Mix in the sugar, add the egg and mix quickly until it forms a large ball. STOP WORKING THE PASTRY. Mash into a vaguely rectangular shape, wrap it in clingfilm and put it in the fridge, have a coffee and sit down for an hour. Divide the dough in half and freeze a portion (you can use this for more cake in the future). Roll the dough out on a floured surface until it’s about 4mm thick. Gently lower it into your favourite pie tin and form gently into the corners. Trim the top of the pastry with a sharp knife and put the pastry into the fridge for another half hour. Pre-heat the oven to 160°C. Put a load of baking paper into the pastry case and fill with baking beans (or uncooked rice or lentils, I use some red lentils I don’t care for). Bake for 40mins. Remove the baking paper and contents and put the pastry back in the oven for 5 more mins to brown the middle slightly. Take out of the oven to cool while you prepare the almond filling. Leave the oven on, you need it at 160°C in ten mins anyway. Beat the sugar, butter and vanilla essence together. Add the ground almonds and flour and mix well. Beat the eggs and add a little at a time, mixing well. Spread the jam on the bottom of the pastry case. Pour over the almond filling. Drop in some raspberries. Bake at 160°C for 45 mins. Cool in the tin. Turn out and serve with the best coffee you have.